Review date: 31 December 2001. It had been simply weeks since I last upgraded to a newer, higher-tech, larger-muscled PC, so time it was to do so once again. And you all get to hear about it. Aren't you lucky. Here's what went into the new PC, and why I chose it, and how well it worked. I had to get a case with a window. Sorry. I just had to. 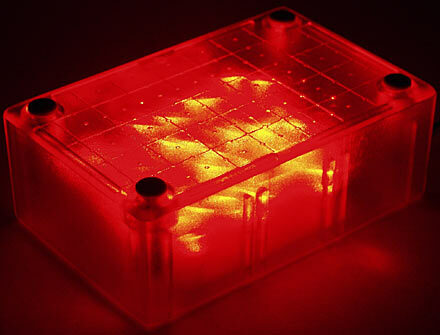 The reason why I just had to is that I made an LED case light for an Atomic: Maximum Power Computing magazine how-to feature. That piece is now up on this site, as well; you can read it here. I couldn't just leave the light sitting on the shelf. I'm sure you understand. I decided not to go the true-Jedi way with this computer, and just bought a windowed case off the shelf rather than making my own. 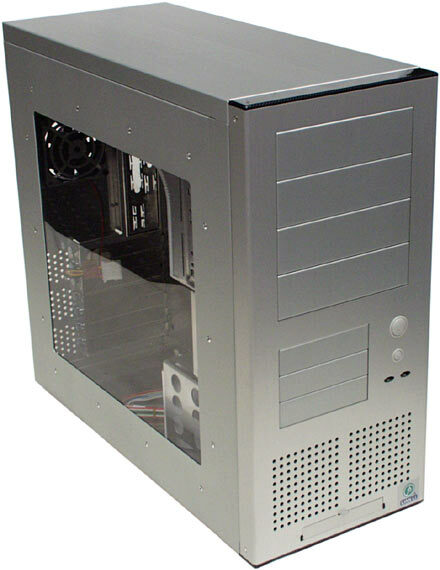 The Lian Li PC-65 is closely related to their very popular PC-60; it's aluminium, it's got a ton of drive bays (four 5.25 inch and eight 3.5 inch), it's got two intake fans and one exhaust fan mounted as standard, it's got a slide-out motherboard tray, and it's... well, it's not cheap exactly, but it's not as expensive as Lian Li cases used to be. Aus PC Market here in Australia sell it for $AU412.50 including delivery in the Sydney area; delivery elsewhere for cases costs more. 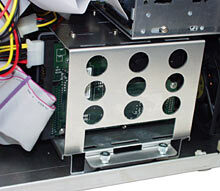 The acrylic window in the left hand side panel of the PC-65 (as you look at it from the front) is standard equipment; no Dremel, hacksaw, angle-grinder or polearm use is required. It's quite solidly mounted, and looks great. It's still an acrylic slab, though, which means it's easily charged with static electricity, and attracts dust on both sides. I don't think the static's a serious component-damage risk, but the dust is a bit annoying. The only way to avoid it is with an earthed metallised window or a glass one, though. The new-style vertical lower drive cage in the PC-65 lets you install up to five 3.5 inch devices there, all cooled by the standard speed-controllable twin 80mm front fans. I only ended up with a couple of drives in the bottom bay, thanks to switching my main boot drive from an old-ish 20Gb Quantum to an 80Gb Western Digital, yours for $AU407 delivered from Aus PC Market. The new big drive allowed me to retire one of my previous extra drives. The new drive follows the ancient tradition of misleading drive capacity statistics; it actually has 74.5 gigabytes of formatted capacity. It's 80,023,715,840 bytes, to be exact, which is more than 80 billion bytes and so counts as 80 gigabytes by hard drive manufacturers' standards. If you take kilo- and mega- and giga- in the computer sense to refer to 2^10, 2^20 and 2^30, though - which you should, because they do - suddenly the drive isn't as big as you were promised. SI unit enthusiasts have recently managed to kick up a burst of media coverage concerning their campaign to get units of computer memory referred to as "kibibytes", "mebibytes" and "gibibytes". This campaign would seem to me to be doomed to failure, though, partly because those terms sound much the same as the old ones, and partly because they sound silly. Lian Li cases don't come with a Power Supply Unit (PSU). If you're going to get yourself a wanky case with a window, you might as well get a stupendously over-rated PSU to go with it. Hence, the above shiny twin-fan lump, which is an Enermax EG651P-VE FMA, with a frankly outrageous 550 watt continuous output rating (the same as the earlier EG651P-VE, which I review here). It's $AU297 delivered from Aus PC Market. There's some reason to bother with a gigantically capable PSU, even when you know your PC's never going to stretch it to more than half of its total capacity. As I explain here in my review of a high-rated Topower PSU, high-performance PCs can put pretty amazing demands on the +3.3, +5 and +12V rails from a PSU. 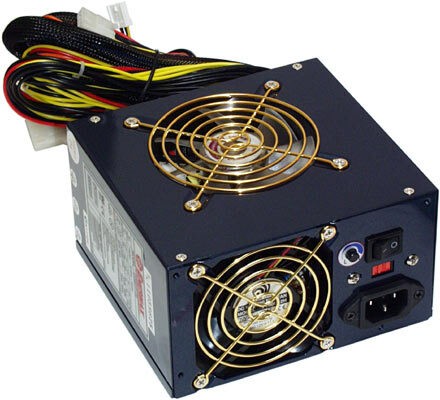 A lower rated PSU may seem, just looking at the aggregate power numbers, to be perfectly adequate. But it may not be able to consistently deliver 80% of its full rating on, say, the 3.3 volt rail, when the 5V rail is under heavy load too. That said, a much less flashy quality brand name 300 watt PSU would probably run this new box of mine just fine. A crummy no-name 300 watter, or one of the 250 watt or lower rated PSUs that come with super-cheap cases, wouldn't. But the 550W Enermax is definitely overkill. It's such pretty overkill, though. One 90mm intake fan. Clear blades (just because), gold grille (why not? ), all set into the blue lacquered metal-flake finish box of the PSU. 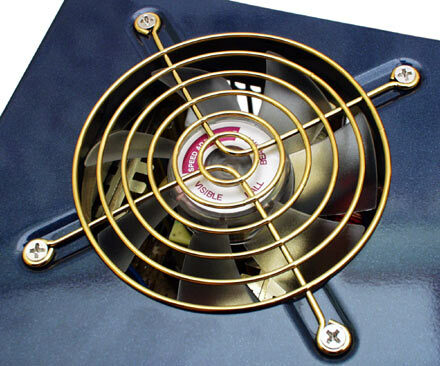 This fan's thermally controlled; if the air it's sucking out of your PC's box isn't hot, then it won't make much noise. The 80mm exhaust fan on the back of the Enermax only has black blades (awww...), but it's also got this little speed control knob that lets you wind it down to inaudibility, if you like. Since it's the middle of the Aussie summer as I write this and my computer room's not air conditioned, I left the fan at full power. Thanks to the thermally controlled intake fan, this twin-fan ludicrously grunty PSU still makes no more noise than the average single-fan 300 watter, unless your PC's really toasty inside. And if that's the case, then a bit more fan noise is definitely preferable to a lot more crashes. As well as the usual ATX and ATX12V and AUX connectors, the EG651P-VE FMA also gives you no fewer than 11 large drive power connectors (the ones usually referred to as "Molex connectors", but that's not accurate any more), and two floppy drive power connectors. You probably don't need to power more than one floppy drive - I don't. But there are a few expansion cards - like the IEEE-1394 controller card I use, for instance - that have a floppy power socket on them. So it's nice to have a spare plug. 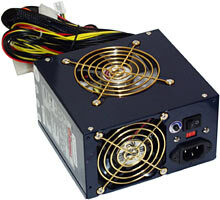 Enermax's page for this PSU says it's only got one floppy power plug, but the one I got has two. Abit's KR7A-RAID is not the perfect Socket A DDR-memory overclock-and-tweak motherboard, but it's pretty good. It's based on Via's Apollo KT266A chipset, it's got BIOS-adjustable Front Side Bus and multiplier (of which more in a minute) and CPU, RAM and I/O voltages, and it's also got good stability at high FSB speeds, a couple of useful extras, and no pointless frills. 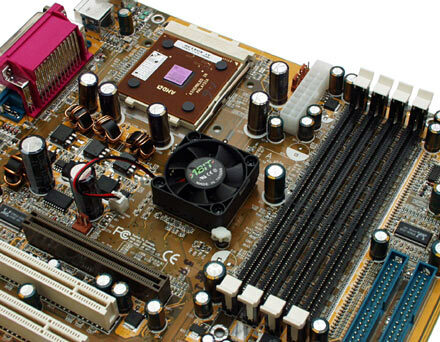 In raw performance, all motherboards that use a given chipset are very much the same. Not exactly the same; generally, newer boards using Chipset X will be somewhat better tweaked than older ones, and will pip the older ones by small margins for various low-level benchmarks. The difference this'll make to any real world task, though, is practically certain to be irrelevantly small. For what it's worth, the general consensus in other reviews of the KR7A (like this one, for instance) is that it's faster than other KT266A boards, without sacrificing stability. That's nice to know, but it really doesn't matter, because of the minuscule size of the performance margins. Pay more attention to other features. If you want built-in USB 2.0, for instance, then you might well prefer MSI's K7T266 Pro2-RU , which is a KT266A board with RAID and built-in audio, and USB2, for $AU330 delivered from Aus PC Market. Plus, it's red. The KR7A-RAID's four memory slots let you install up to 3Gb of plain unbuffered DDR RAM or up to 4Gb of registered memory. Registered DDR RAM is much more expensive than unbuffered and slightly slower, but works better in super-high-capacity configurations, hence the difference. Whether the KR7A-RAID can really handle four 1Gb registered DDR modules, I don't know, because I don't have the Huge Sack Of Gold Pieces I'd need to buy the things. That much registered DDR RAM can't be had anywhere for less than about $US1600 as I write this. Since two or three 256Mb unbuffered PC2100 modules ought to do just fine for pretty much any normal PC task, though, this isn't an issue for practically anybody buying this board. The KR7A-RAID has that "RAID" on the end of its name because it's got a second two-connector IDE controller built in, allowing you to connect a total of eight IDE drives before you need a separate controller card, and run up to four of them in a RAID 0, 1 or 0+1 configuration. My old IDE RAID piece here covers what the heck this means, in case you're wondering. The second two ports are run by a HighPoint Technologies HPT372, the latest evolution of their popular and inexpensive RAID-capable controller. 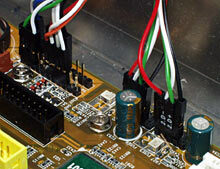 The HighPoint chips are popular with manufacturers of motherboards and standalone controller cards for two reasons. One - they're dirt cheap. 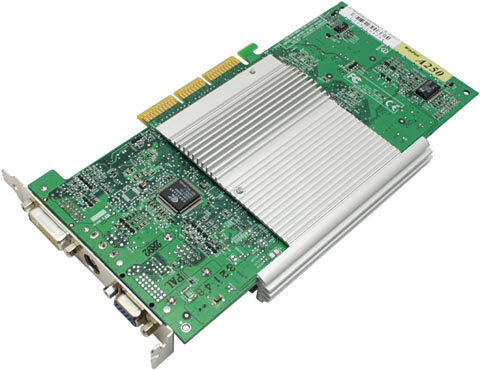 "Serious" IDE RAID controllers are expensive, but support lots of RAID modes and lots of drives. The HPT370 and 372 lose in the modes and multi-ports stakes; it's RAID 0 and 1 and 0+1 only, with up to four drives, for both of them. But they're cheap. The second reason for the popularity of the HighPoint controllers is that they don't have to do RAID. By default, they're just perfectly normal IDE controllers; you have to press Control-H when prompted during the boot process to turn drives plugged into the HighPoint ports into a RAID set. "Serious" RAID controllers aren't likely to be plug-and-go if all you want is separate drives, and they may not be able to do it at all. Of course, the people who buy serious RAID controllers don't want separate drives; if they did, they'd buy cheaper controller cards. For the mainstream market, though, a simple dual-mode controller is a good fit. The new HPT372 differs from the HPT370 in only one significant way - it supports the new Ultra DMA/133 IDE transfer mode, with a peak bandwidth of 133 megabytes per second. The older controller supports only Ultra DMA/100. This difference is pretty much totally trivial; a given pair of top-end IDE drives isn't likely to be physically capable of saturating either bus for any significant period of time, and in actual use will probably never do it for more than the occasional microsecond. Still, it's nice to have, and the drivers for the HPT372 don't seem to suffer from Version 1.0 Disease. If you've got visions of light speed booting and ultra-performance serious database serving from a cheap HighPoint controller, abandon them. These controllers let you mirror drives for data security and stripe them for capacity adding and some small performance boost, but they are not an industrial-strength storage solution. For that, you need at least an expensive Real Man's IDE RAID Controller, and maybe a far more expensive SCSI solution. SCSI drives continue to cost a lot more than IDE, per megabyte. Feel free to use the RAID functions if you've got a use for them, but otherwise, just use the extra ports for more drives. If you don't need RAID functions or more than four IDE drives, there's no reason to pay the extra for a "-RAID" motherboard. The KR7A-RAID is $AU396 delivered from Aus PC Market; the plain RAID-less KR7A is otherwise identical, but only $AU341 delivered. The KT266A supports multi-channel on-board audio, but the KR7A-RAID doesn't implement that; you've got to use your own sound card. That's OK, because you have to anyway if you want really high quality sound, or extras like optical ins and outs. On-board audio is generally perfectly adequate these days; it uses a little CPU power, but all current CPUs have a lot to spare. Motherboards based on Nvidia's nForce chipsets can have full Dolby-certified 5.1 channel surround output, but you still need a separate card if you want good hardware-accelerated 3D positional audio, and other frills. The KR7A-RAID also comes with Norton Antivirus 2002, which is unusually up to date for bundled software and is compatible with Windows XP. Well, it's probably as compatible with WinXP as any anti-virus software is, anyway. 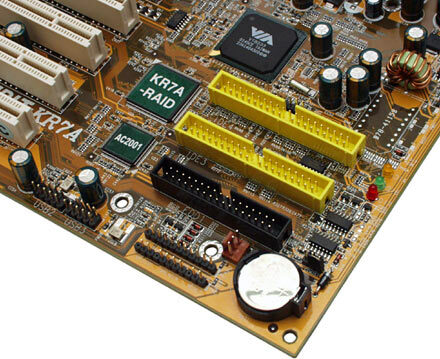 There's a FAQ about the KR7A boards, covering a surprising amount of stuff for such a young motherboard, here. The FAQ came in handy when I needed to know what to do with these. This bewildering collection of tiny plugs are on the ends of the cables from the Lian Li PC-65's four front USB connectors. There used to be just one plug per connector, but there are at least two kinds of extra-USB-port header on modern motherboards, with different pinouts; one plug won't do. So Lian Li have split their connectors up into lots of tiny rearrangeable plugs that have only one or two wires each. The KR7A FAQ gives you the motherboard USB connector pinout, which is easy enough to understand once you figure out that it's treating the two blocks of nine pins as one contiguous 16 pin connector, ignoring the single key pins at the ends of the blocks and only counting the eight sets of paired pins. The motherboard manual tells you pin 1's at the bottom right, the Lian Li info-sheet tells you which of the USB port leads are which, and you only need to connect four wires per USB connector, anyway - one power connector (VCC), one ground, one two-wire data plus and minus connector. Those are the USB connectors on the right; the normal motherboard headers are on the left. Like all sliding-motherboard-tray Lian Li cases, the PC-65 has a plug and socket in its motherboard header leads that lets you disconnect and reconnect them easily, but there's no matching connector in the USB leads. Now that I've hooked up the new-style USB sockets once, I could do it again very easily. But this is exactly the kind of task that gives first-time PC-builders the willies. You don't have to connect the front ports at all, fortunately; the KR7A boards come with the usual rear-slot dual-port bracket that's much easier to set up. You can only connect two of the front ports to the KR7A; to run all of them you need a motherboard with four extra USB port headers. Here's a 256Mb PC2100 unbuffered non-parity Crucial DDR memory module, yours for $AU176 delivered from Aus PC Market (or, as I write this, for $US71.99 plus shipping from the Crucial on-line store). It's rated at CAS level 2.5 for 133/266MHz operation (133 actual bus speed, 266 after double-data-rate-ification), but it's likely to be able to run significantly faster. 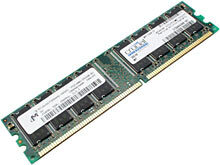 Micron (Crucial is Micron's "factory store" brand) do not make rubbish RAM. Here, for comparison, is an OCZ "PC2400" module. PC2400 isn't an official speed standard, but it's not a misleading name - well, not any more so than PC2100, anyway. OCZ promise that this RAM'll work at CAS 2 at 150/300MHz. Standard Data Rate (SDR) SDRAM is named according to its bus speed. PC66, PC100, PC133; 66MHz, 100MHz, 133MHz. The memory may be able to run faster, especially if you wind up the CAS latency (CAS 2 PC100 RAM may be CAS 3 PC133, for instance), but it runs at the specified latency at the specified speed. No problem. 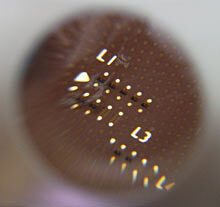 Double Data Rate SDRAM, though, is named according to its theoretical maximum bandwidth, not its bus speed. "PC1600" DDR memory has a 100MHz base bus speed, which is DDR-doubled to 200MHz, and lets it theoretically shift 1600 megabytes per second. You won't move that much data per second in the real world; roughly half is more like it. But don't tell the marketing people that. It'll only depress them and cause them to invent another trading card game. With this naming scheme, plain old PC100 could be referred to as PC800, but shouldn't be, because that confuses it with Rambus memory, which polite people try not to talk about. 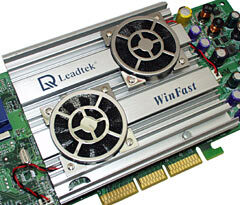 PC2100 DDR memory runs at 133/266MHz, and has a peak bandwidth of 2100 megabytes per second. 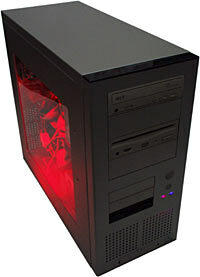 And "PC2400" DDR will peak at 2400Mb/s, if you run it at 150/300MHz. If you don't, it won't. As I explain in my older review of some OCZ SDR memory here, CAS latency isn't a big deal. Lower latency is better, but not enough better that anybody should get excited about it for its own sake. If memory can't run at any available latency setting at the speed you need, then that's a problem, but if you have to drop to CAS 3 to get some particular FSB happening, you might as well do it. CAS latency only affects how long the memory takes to respond to a command, not how fast it transfers data once it's responded. At 300MHz, the response time difference between CAS 2 and CAS 3 is three and a third billionths of a second. The KR7A lets you set your memory to CAS 2 at elevated speeds, and offers memory bank interleaving, too; you might as well turn all of this stuff on if your RAM can take it. Don't expect anything noticeable to happen to your PC's performance when you do, though. Still, if a memory module works in full geeky tweak mode at 150MHz, it'll probably work with less aggressive settings at considerably faster speeds. Which is nice. As it turns out, both of these RAM modules worked fine at a bit more than 150MHz and CAS 2. There was a reason for that. 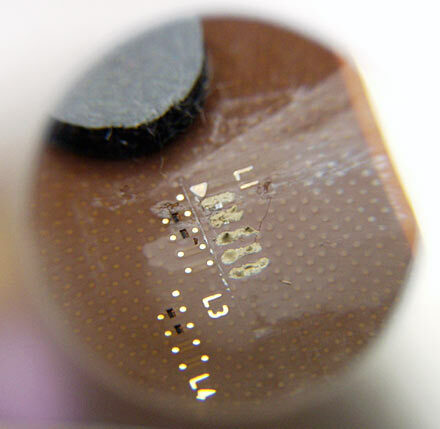 On closer examination, it becomes apparent that both 256Mb modules use the same Micron Technology 46V16M8 chips. OCZ, however, say that they use "handpicked chips" to ensure their RAM meets the higher specs they claim for it. Well, you're certainly not paying a big premium for the hand picking. OCZ's own Overclockerz Store is selling the 256Mb PC2400 modules for only $US64.99, plus shipping. That's less than Crucial charges for their "PC2100" module with the same chips! In the real world, given the chip similarity, I didn't expect to see any performance or overclockability difference between these two modules, and I didn't. Which is good, because FSB overclocking seems to be quite definitely the way to go if you're interested in running an Athlon XP faster than stock speed, as I'll explain shortly, and I wanted to be able to use both modules at elevated speeds. Looking at OCZ's pricing for their modules, you really can't go wrong. I don't have enough data to say whether their hand-picking actually makes their modules better than the plain Crucial version, but unless they're actively hand-picking lousy chips, they're not likely to make something worse. And they're cheaper than Crucial. What's not to like? By the way, although many motherboards allow you to set CPU FSB and RAM bus speeds separately, doing so is not a great idea from a performance viewpoint. Running either bus faster than the other means that one's going to be waiting for the other now and then. FSB faster than RAM will give you pretty much the same performance boost as you'd get with both buses the same, unless you're doing very memory-intensive tasks, which most desktop PC users (including game players) aren't. So it's not that bad if you've got RAM that can't run quite as fast as your FSB, as long as you've got a motherboard that lets you split the two up. RAM faster than FSB is pretty much pointless, though. The performance gain is likely to be uselessly small, even for quite large RAM overclocks. Yeah, yeah, it's not a GeForce3. I'll swap one of those in some time soon, if a GeForce4 doesn't fall from the sky first, but for the moment I'll stick with the cheapest of Prolink's Nvidia Titanium chipset cards. This one's a Leadtek WinFast A250 Ti4400 card; Aus PC Market, as I write this update, currently have the rather fancier WinFast A250 VIVO Ultra TD Ti4600 card for $AU682, delivered within Australia. ...which wraps around onto the back of the board, for good measure. Ti4400 and Ti4200 cards like the one I review here are better value than Ti4600s. Prolink's Pixelview GeForce2 Ti is, in its basic performance, more or less like every other GeForce2 Ti card out there. 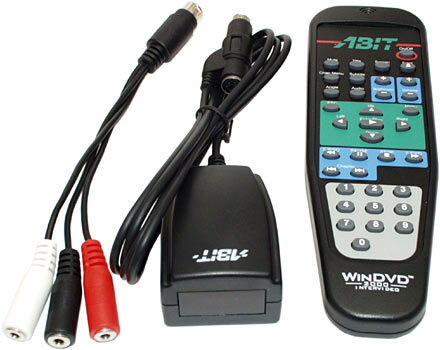 It gives you TV output - the usual dual-flavour type with an augmented S-Video connector that lets you plug in a mini-DIN S-Video (Y/C) cable directly, or use a little adapter cable (included) to get a standard RCA composite video connector, which you can hook up to more basic TVs and VCRs and what have you. The box contains the card, an RCA-to-RCA lead, a driver disc and a manual, but that's it; no fancy software bundle, and no other extras. If you want an all-options video card then this isn't the one to choose, but if you're looking for a cheap GeForce2 Ti, Prolink should have you covered. 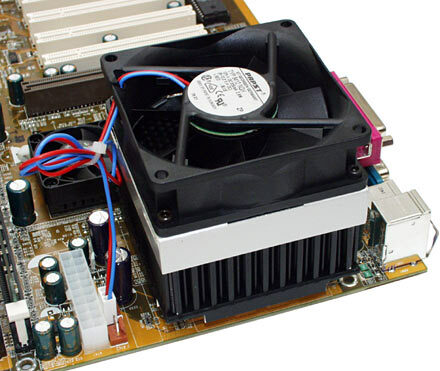 The basic package of the Pixelview card, and its lack of flashy but useless heat sinks on its RAM, ought to keep its retail price at the low end of the GeForce2 Ti market. And since I often recommend that people choose Nvidia-chipset graphics cards based on nothing but price because all cards with a given chipset are much the same, that's a good place for it to be. Cheap this card should be, but it's not slow. GeForce2 Ti cards are, normally, between a GeForce2 Pro and a GeForce2 Ultra in performance. The only difference between the full GeForce2 cards (as opposed to the cheaper GeForce2 MX cards, which all have much slower memory) is core and memory clock speed. 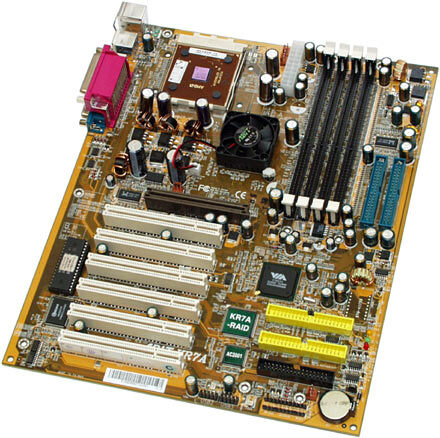 The original GeForce2 GTS runs at 200MHz core speed and 333MHz memory speed (after DDR doubling - all full GeForce2s have DDR RAM), the Pro is 200MHz/400MHz, and the Ultra is 250MHz/458MHz. The GeForce2 Ti gives you 250MHz/400MHz - Ultra core speed, Pro RAM speed. Well, that's what it's meant to do, anyway. The Prolink GeForce2 Ti card runs, by default, at 250MHz/444MHz - near as makes no difference to full Ultra speed. And, despite the absence of show-off RAM heat sinks, it worked just fine for me for a few hours of on-line gaming in hot weather. What's all this clock speed palaver mean in the real world? Not a huge amount. Winding up the core speed of a GeForce2 does little for performance unless you're running low-ish resolutions, and may not help even then, if your CPU ends up being the limiting factor. Which it probably will. RAM speed makes a big difference at very high resolutions and when you're using Full Screen Anti-Aliasing (FSAA) to smooth out jaggy diagonals, but the RAM speed difference between the normal stock speed Ti and the Ultra at stock speed is under 15%, which will add up to an imperceptible sub-10% frame rate difference. The real world difference between the "pre-overclocked" Prolink card and a stock-speed Ultra is almost unmeasurable. So, broadly speaking, the GeForce2 Pro and Ultra and Titanium can be regarded as much the same product performance-wise, and the Prolink Ti card's extra standard RAM speed, while nice, isn't a big deal. If you've got something with sub-GeForce2 GTS performance then there's justification for buying any one of these higher-spec GeForce2 cards. But there are other options. Like, for instance, the GeForce3 Ti200, which is the (comparatively) cheap GeForce3. Prolink make a Ti200 card as well, of course, but they didn't have a spare one to send me. Dang. At its default clock speed a Ti200 card's around 10% slower than the original GeForce3. That isn't a difference you're likely to notice, but you can overclock all Ti200 cards up to original GeForce3 performance anyway. An overclocked original GeForce3 will probably still beat them, but again only by a non-exciting margin. 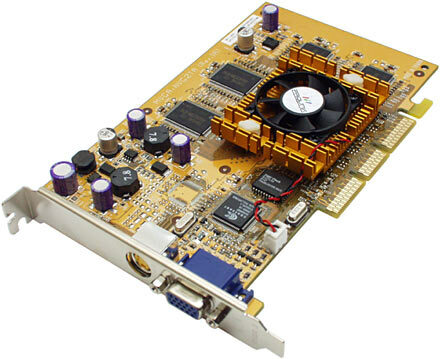 Head over to the flea marketeer's price reference and you'll find 64Mb GeForce2 Ti cards like the Pixelview one for under $US100, not including the usual Did You Really Think It Was This Cheap fees from the bottom-feeding dealers on the first page of search results. Normal street price is more like $US150. GeForce3 Ti200s, on the other hand, start from $US160 or so from the suspiciously cheap brigade; not much more than $US200 is not out of the question from real retailers. GeForce3s are current technology; GeForce2s are one generation old. Usually, this means a big fat price difference that substantially outweighs the performance gap, but that's not quite how it works in this case. Most of the price of the GeForce2 Ti is memory. 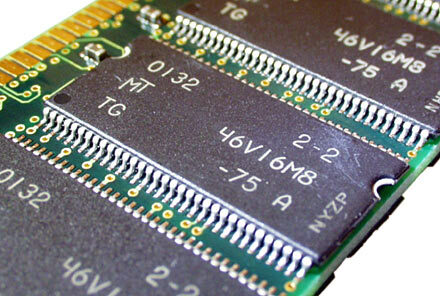 Fast DDR RAM chips aren't cheap. Even if the core chip cost nothing, a 64Mb GeForce2 Ti would still have a hard time making it into the real budget video card category. This RAM price overhead keeps the price difference between the GeForce2 Ti and the GeForce3 Ti200 down to around a factor of 1.5. So, logically, if the GeForce3 Ti200 gives you about 1.5 times as much performance as the GeForce2 Ti - and if you can actually see that performance difference - then it's just as good a deal. Maybe better, since game programmers seem likely to actually use the GeForce3's fancy programmable hardware 3D acceleration features, which is more than can be said for the hardware Transform and Lighting functions in earlier GeForce flavours (I expand on this issue in my review of Prolink's original GeForce3, here). A GeForce3 is a more future-proof video card than a GeForce2. Then again, both of them will be worth approximately nothing in a few years. Aaaaanyway, the GeForce3 Ti200 does have around 1.5 times the performance of the GeForce2 Ti, even without any fancy programmable shader tricks being taken into account. This Prolink card competes a bit better than the average thanks to its faster RAM clock speed, but the difference isn't a big one. As a result of their performance bonus and reasonable price, Ti200s have been selling rather well, and GeForce2 Ti cards... well... haven't. GeForce2 Tis are certainly not rubbish - if they were, I wouldn't be putting one in my show-off PC. 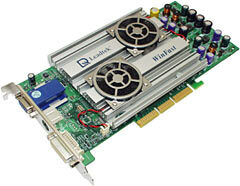 And I like this Pixelview card; it's low on the pose and high on the value, by GeForce2 Ti standards. I know this is a silly show-off PC, but heat sinks on SDRAM still just annoy me. On balance, though, I still reckon the GeForce3 Ti200 is a more interesting product than the GeForce2 Ti. Cheap. Fancy. Good-sounding. Pick any three. Abit's AU10 sound card isn't a new product, but it's continuing to compete very well for the dollars of savvy consumers who haven't fallen victim to Creative's marketing muscle. Until fairly recently, I quite liked Creative's sound cards. Sure, they didn't have the signal to noise ratio of a Turtle Beach product, but few home and office users need true studio-quality recording. And sure, the top-end Sound Blaster Live models with zillions of ins and outs were (and are) rather excitingly expensive, but you can lay your hands on a Live Value OEM card in an anti-static bag with no fancy software bundle for $AU115.50 delivered. Not much hip-pocket pain there. But, I'm afraid, the darn things have just caused too many people too many problems lately. Never mind the hilariously gigantic "driver" installers that also install flashy unstable "LiveWare" apps which you may or may not want; the basic drivers themselves have frequently turned out to be unacceptably flaky, lately, and the cards have PCI bus interference issues on more than a few current motherboards. Creative certainly aren't the only company that's had these sorts of problems, but they haven't done a whole lot about it yet. They may be getting their act together soon, mind you; as I write this, the Sound Blaster software page says Creative are modifying the widely hated LiveWare package "to make it more intuitive and efficient for a larger proportion of our user communities". Like, for instance, that proportion of the community that'd like LiveWare to not crash quite so often. In any case, Creative may still be generally thought of as the 800 pound gorilla of the PC sound market, but their gear really doesn't do much (or anything) for the average user (or for me, for that matter) that you can't get from various other solutions. Just sticking a pin into a list of yum cha sound cards is likely to get you something with far fewer features or significantly worse driver issues than any current Creative product. But if you make a more educated decision, you can easily do better. You can, for instance, get more features for less money. By, just as an example, buying an Abit AU10. 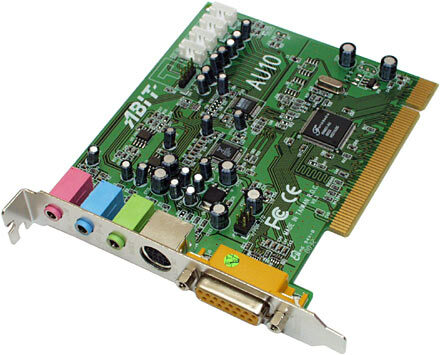 The AU10 is a full 5.1 channel surround-sound card with good 3D positional audio support, and it sells for only $AU110 delivered from Aus PC Market. Here are the hardware extras you get with the AU10. Yes, that's an infra-red remote control. Yes, it lets you use your PC as a proper living room DVD player - if you can be bothered setting such a solution up. You get InterVideo's no-longer-new but still perfectly good WinDVD 2000 software DVD playing package with the AU10; all you need is a DVD-ROM drive to go with it. If you're running an NT-series operating system - Win2000 or WinXP - then the bundled version of WinDVD 2000 will only work in plain stereo two channel mode, and the AU10's 5.1 channel capabilities will go to waste for DVD playing. Intervideo offer cut-price upgrades to the current v3.0 version of the software, though; apparently that works fine for full surround in Windows 2000 and XP. 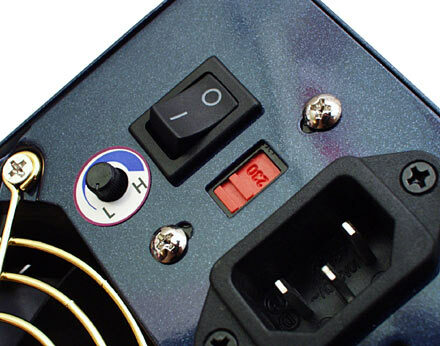 The AU10's remote control receiver plugs into a PS/2 keyboard socket via a pass-through connector. The back of the sound card has another mini-DIN connector on it, into which you plug the included breakout cable that gives you all six channels for 5.1 speaker mode (left and right front, left and right surround, centre front, subwoofer), in three standard 1/8th inch stereo connectors. I'm unconvinced of the value of a PC as an elegant home video solution, but we are getting closer and closer to getting such a thing working properly. If you're strapped for space and have the PC already, there's definitely something to be said for putting the DVD playback and surround sound gear all in the one box. You're not just replacing a cheapo DVD player, you're replacing a surround sound processor too. The Abit remote's not likely to be directly useful for any DVD player program besides WinDVD 2000, unless those programs have the same key mappings. The remote, thanks to its keyboard-port interface, just emulates perfectly normal keyboard keys. The four-way direction pad on the remote, for instance, emulates the four cursor arrow keys, and the Play button in the middle emulates Enter. This means you certainly could use the remote with any application that uses the keystrokes the remote receiver emits, or which can be configured to do so. You could easily use it for basic business presentation control, for instance. It's also been pointed out to me that Visual Domain's Remote Selector program could be a good match for the Abit remote. One of Remote Selector's features is the ability to act as a remote-control-enabling wedge between a selection of DVD playing packages and the outside world; it'll just think the Abit remote's a keyboard, and work accordingly. The remote's still not likely to be a big selling point for people who aren't interested in remote DVD playing, but who cares - it's not as if you're paying big bucks for the thing. Even if you never take the remote out of the box, this is still a well priced sound card. The AU10 is based on Fortemedia's FM801 chip, which with the current drivers (which you can download from Abit) gives you DirectSound 3D, EAX and EAX 2 support, and that's all you need for perfectly acceptable 3D sound in all current games. The driver reports 256 hardware sound streams for every 2D and 3D sound mode, which it totally doesn't have; it's cheating and just reporting software-mixed audio modes as being hardware. But it works fine, and doesn't need a very grunty CPU. This is not a system-hog sound card. There's software-emulated support for Aureal's old A3D 1.0 positional audio Application Programming Interface (API) as well, so even old 3D sound games should be able to do better than plain stereo. Apparently, earlier FM801 driver versions only did positional audio properly for the speaker output modes, not headphones. Headphones aren't just the way to play loud games in the middle of the night without waking the neighbours; they're also the choice of connoisseurs who're using 3D sound to make them more effective in a game, not just for atmosphere. Positional audio works better through 'phones than through speakers, largely because there are no cross-talk issues where the left ear gets to hear the right ear's input. It seems that the no-'phones problem has been dealt with in the current drivers, though, because 3D sound through headphones in Tribes 2 seemed fine to me when I tried it. It's not the finest sounding 3D audio I've ever experienced - I wish there were full NT-series Windows drivers for my old Aureal Vortex 2 card, instead of mere stereo ones - but it'll do. The FM801's MIDI implementation is a lame FM synthesiser (Casiotone ahoy!) but the AU10 comes bundled with a Yamaha software synth that takes care of that problem, for those who care about MIDI music. For the money, I think you'll be quite hard pressed to find a better multi-function sound card than the AU10. If you don't care about 5.1 channel output or the remote then you can save a bit more, but not a lot more. All the cool kids are using Athlon XPs these days. With the "Palomino" core in the XP, AMD have made a CPU that can run at higher clock speeds than the older "Thunderbird" core (which is still being made as I write this, but won't be for a lot longer). The Palomino also runs a tiny bit faster at a given clock speed, and produces roughly 20% less heat at a given speed than the older core. That last point is a significant one. Athlons run warm. This Athlon XP is a "1600+". This does not mean it runs at 1600MHz, although whichever distribution wallah wrote "1.6" on this one in indelible marker possibly thought that it did. An Athlon XP 1600+ actually runs at 1400MHz (133MHz FSB, 10.5X multiplier) in stock spec, but performs easily as well as a 1.6GHz Pentium 4, so the "1600+" designator isn't particularly misleading. AMD's whole "QuantiSpeed Architecture" folderol is their way of selling chips to people who can't look past raw clock speed. Those same people are probably quite able to understand that a 3.6 litre six cylinder Porsche 911 is rather more than 20% faster than a three litre six cylinder Toyota Camry, but similar insights concerning CPU performance have not yet struck them. Hence, the pumped-up Athlon XP model designators. AMD, by the way, don't actually come out and say that their ID numbers are putting Athlons up against P4s; they instead tug at their collars and say stuff about comparable AMD processors, or some such. But everybody knows what they really mean, and they're not lying, so it's not a scandal. If you're building a posey PC with a window, of course, you can't have a stock-speed CPU in it. You gots ta overclock, man. Overclocking a Socket A CPU by just pushing up the FSB speed is easy. But it won't get you much street cred. You've got to unlock its multiplier, or buy a CPU with an unlocked multiplier in the first place, so you can use your tweaky motherboard to change the multiple of the FSB at which the CPU core runs. This is a bit of a problem for the Athlon XP, because unlocking it is rather trickier than it was with the older Socket A CPUs. And AMD also seem to have given up the habit they had for a while of making their fastest chips at any given moment factory-unlocked. Even if you pay the big bucks for an Athlon XP 1900+ (or 2000+; they're coming shortly), you seem to be pretty much certain to get a multiplier-locked CPU. To unlock a Socket A Thunderbird Athlon, you just have to draw a pencil line across each of the minuscule L1 bridges on the CPU, which are laser-cut on locked chips. You can use fancy conductive varnish or any number of other more durable joining strategies if you like, but pencil works fine, generally. The Athlon XP can't be unlocked with a pencil, partly because it needs a lower resistance between its L1 contacts, and partly because the cut is now a comparatively deep rectangular pit, not a simple flat scorch mark. If your joining-stuff fills the pit as well as connecting the dots at either end, it won't work. So you need to fill the pits with something non-conductive, then bridge over the top with something very conductive, and it's all quite a large hassle. A round-headed pin, for applying goop to your CPU. Some little tape tags, for easy masking-off of bridges that you don't want to goop up. 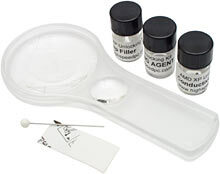 A plastic magnifying glass with a fair-sized 3X lens and a smaller 6X lens. You use the big lens to see what you're doing when you're working on the CPU, and the little one to inspect your work afterwards. Two tiny jars with a small squirt of grease in them. One jar contains non-conductive grease, for filling the pits; the other one contains conductive grease, for bridging the gaps. There's only a fraction of a cubic centimetre of grease in each jar, but since you're applying it in pin-point quantities, there's actually enough to unlock many CPUs, or have many uncoordinated goes at unlocking one. Because it's just grease, not glue or lacquer, it's easy to clean up if you make a mistake. There's also another tiny jar containing cleaning fluid, whose nature I couldn't quite pin down by sniffing it, but I'd bet about a buck that it's just rather highly perfumed nail polish remover. There's nothing wrong with that; acetone works well for cleaning the top of CPU packages. ...and a rather better unlocking job. Well, what should have been a rather better unlocking job, anyway. To cut a long story short, I tried it once, and I tried it again, and I got a CPU that'd run at multipliers lower than its stock 10.5, but not higher. Incompletely unlocked CPUs often display behaviour like this. I tried it a number of times in between these attempts, saw that my little grease-blotches were inadequately pretty, wiped them out and tried once more. I never got the pigging thing to work right. I found all this particularly annoying because for the first couple of unlocking attempts, I was using this CPU cooler. Alpha's PAL8045 (reviewed on the first page of my monster CPU cooler comparison, here) is a giant 80mm square unit that takes a normal 80mm fan, for excellent cooling performance without the high-pitched whine of a high powered 60mm fan. This PAL8045, by the way, came to me from the lovely chaps at Microplex Norge in Norway, who also provided the very tasty Papst fan I used with it. 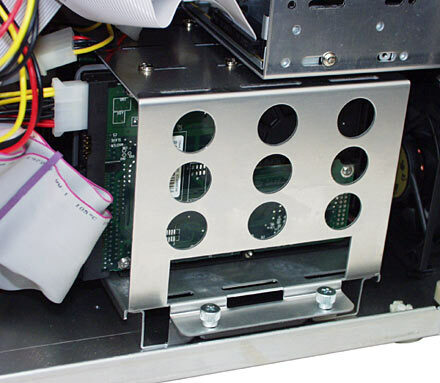 Like most other giant air coolers, the 8045 bolts onto a Socket A motherboard, using the four holes provided for the purposes on most quality boards. It fits the KR7A-RAID perfectly. But any time you want to remove this cooler to get at your CPU, you have to undo the four screws that hold on the fan, then the four spring-screws that hold the heat sink onto the aluminium motherboard standoffs. It's not just a clip-it-off proposition. And yes, the four standoffs that the spring-screws screw into can indeed just spin with the screws if you tightened the screws a bit too much. Which is a bundle of laughs. As I proceeded with my unlocking attempts, I temporarily ditched the fiddly 8045 for an undistinguished clip-on cooler, just to preserve my sanity. The 8045 is an excellent CPU cooler, but it's not a quick-release product. The clip-on cooler helped me get it wrong more times per hour, but after a couple of hours, I was royally sick of all the chip-shuffling and grease-dabbing and CMOS-clearing, and started wondering whether, even if you get it right first time, unlocking an XP is necessarily worth it at all. Surely, I thought, someone will have done some sort of mildly scientific survey to find out whether unlocking the multiplier actually allows you to get Athlon XPs up to a substantially higher speed than you can by just goosing up the FSB? I set out to find such a survey. But first, I crunched some numbers. In stock trim, an Athlon XP 1600+ runs from 133MHz FSB with a 10.5X multiplier. I found it was still perfectly stable at 152MHz FSB (the KR7A supports FSB speeds from 100 to 200MHz, in 1MHz increments), with my nice Micron-chip RAM modules, on the KR7A-RAID. I only needed to boost the CPU core voltage to 1.8V (from its stock 1.75V) to get that happening. Your mileage may vary, of course, but this machine seems perfectly happy at this speed. I didn't have any trouble finding accounts of Athlon XPs wound up rather further than this. There are lots of sites where people talk about their studly overclocking achievements, and some of those sites have impressive databases and screenshot galleries. But there are two problems with them. One, there are schnooks out there who just lie about how fast their PC is. Beats me why they do it, but they do; they're presumably the same genitalmongers that kill people on their own team in on-line games. And it's not as if there's an international certification body to keep their fantasy numbers and Photoshopped screenshots out of the forums. Two, different people have different ideas about what "stability" means. To the average 14 year old Windows ME user, a stable computer is one that only throws its intestines out of its ears twice a day. To a major corporation, a stable computer is one with five-nines uptime - 99.999% reliability, or one hour out of service every 11.4 years. To the average PC user, a stable computer is one that just doesn't crash when it matters. However often that is. Win2000 and WinXP are quite acceptably stable operating systems (shaddap, you x86 UNIX users in the peanut gallery) provided they're not installed on flaky hardware. Overclocking is a leading cause of flakiness. But my last mildly overclocked Win2000 Athlon box only had a crash or hang problem about once a month, and this WinXP one looks just as good so far; I'd call it stable. The trouble is, many people get their overclocking expectations more from the teenage WinME user portion of the community than from the actually-use-the-computer-to-get-work-done portion, if only because the l337 kIdDiEz out there have a lot more spare time to make noise on forums and Usenet. The right attitude to overclocking, unless you're just doing it for the sake of doing it, is that it's a free gift, insofar as it works. It's not something you should expect. If your system gets flakier than you can tolerate when you wind the CPU speed up only 5%, then, well, tough. Sure, some dealers sell CPUs guaranteed to make it to some particular over-sticker speed, but that doesn't mean it's OK to return CPUs to other dealers just because they won't do something that the dealer never said they would. Anyhow, the above several ranting paragraphs are just me telling you that my stability standards are likely to be just as high as yours, even if you're rather picky. I'm not happy with something that only runs long enough for me to get a screenshot. At the 152MHz times 10.5 speed I settled on, my Athlon XP's core is running at 1596MHz, effectively the same speed as an Athlon XP 1900+, which runs at 1600MHz. It's only a 14% overclock and so not worth getting very aroused about, if you ask me. But people pay the thick end of twice the 1600+'s price to get a 1900+, so I suppose someone sees some value in this much extra speed. 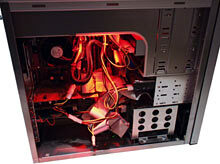 However you get to it, a 1600MHz Athlon XP is a seriously speedy PC CPU. Run a thumb-twiddling small-loop CPU speed tester on it and, depending on how optimistic your bogus benchmark is, you may manage to get more than five thousand million integer instructions per second (MIPS) out of a Palomino at this speed. Two thousand million floating point operations per second? No problem. Less than ten years ago, I thought my five MIPS 68030 Amiga 500 was pretty hot stuff. And it was, too. Sorry about that. Getting back to the present day - to make the fuss of unlocking an Athlon XP worth it, you'd really want to be able to get more than a 20% overclock. Something quite noticeably superior to a lousy 15% or so. 25%, say. Well, the other people that've reviewed the HighSpeedPC unlocking kit don't report those kinds of results. They all seem to be able to at least make the darn kit work; I presume I must just be a klutz. But I'm not seeing any big fat overclocks from unlocked Athlon XPs, no matter what unlocking method was used, if you don't count the loonies. And I will count the loonies in a moment. But first, the relatively sane. AMDPower reviewed the HighSpeed PC kit here and liked it, but they only got a 1600+ to 1.53GHz using it, on an unspecified motherboard. That's a sub-10% overclock, which you can easily do via FSB on all sorts of motherboards and with all sorts of unexciting RAM, and which is unlikely to be detectable without comparing benchmark numbers. Maybe they could have done much better on a board like mine. Maybe invisible numbats live in my monitor. Who knows. Rodney Reynolds at 3DGameMan did one of his Video Reviews on the unlocking kit too, and he seemed to like it a lot. But I don't think he said a thing about any actual performance results, with or without unlocking. He did manage to get three syllables into the word "Athlon" every time he said it, though, which I suppose counts for something. There are various other pieces about unlocking XPs on the Web, but there's a dearth of analysis, as opposed to just simple (and often very good) instructions on how to do it. VR-Zone's article at least verifies that their test CPU made POST at every available multiplier, but didn't find out what the maximum stable speed was. Or even just the maximum speed at which some flavour of Windows would load, which is a reasonable quick and dirty ceiling-speed test. ChillBlast have another perfectly good unlocking guide here, but they didn't go on to figure out whether the effort was worthwhile, either. If you're running the standard 133MHz FSB (for a 266MHz CPU-to-chipset and DDR RAM speed), the fastest you can run an Athlon XP at the moment is only 1666MHz ("2000+" rating), anyway. That's where you run out of multipliers - 12.5 is as far as it'll go. If you want more, you have to tweak the FSB, even if your CPU is unlocked. Which brings us to the lunatic fringe. The VR-Zone yo-check-my-l337-WCPUID-screenshot pages for Athlon XP overclockers here make clear that the name of the game for World Speed Record types at the moment is outrageous cooling, beyond-belief FSB speeds, and multipliers which are, if anything, lower than stock. That's apparently just the way it shakes down when you want to get a Palomino Athlon made for 1500 or 1600MHz up past 2GHz. These sorts of configurations generally have only slightly more to do with normal computer systems than the Thrust SSC has to do with cars you can drive on public roads. OK, there are some merely water cooled systems around the top of the leaderboard, and a Vapochill or two, but dry ice or liquid nitrogen are the order of the day if you want your CPU to work at the 2.2-plus volts that's needed to fly the unfriendly skies above 2GHz. And so's a motherboard modification to allow your motherboard to deliver that high a voltage to the CPU. Oddly, though, as you page through the VR-Zone results, the same rule seems to hold true for the people who manage more believable overclocks, with air cooling. Which may or may not mean "eight inch duct from my five horsepower air conditioner", but let's be charitable. These overclockers are still either reducing the multiplier of their CPU, or not changing it at all. The overclock comes from a huge FSB and a silly CPU core voltage that often still requires a motherboard mod, or a motherboard that permits rather unwise above-1.9V settings as standard. But these guys are only managing speeds around the 1800MHz mark, an unthrilling 12.5% or so above what I managed to get without modifying anything. As I write this, the first system in the VR-Zone leaderboard that's running a higher than stock multiplier is back on the fourth page. It's a 1600+, like mine, pushed all the way to 1680.58MHz according to WCPUID's somewhat fuzzy calculations, at a 12X multiplier and 2.03 volts. Well, hurrah. Five whole per cent faster than my PC. Declare a national holiday. 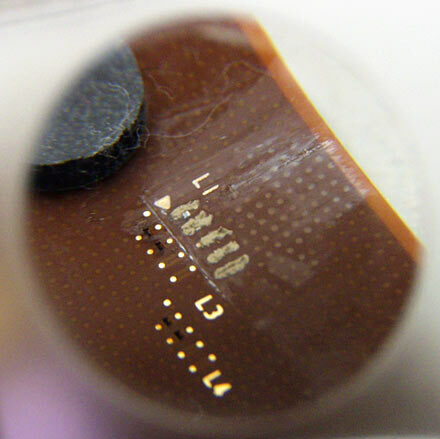 Moving on, the Tom's Hardware unlocking guide here shows you how to do it the less forgiving way, with cyanoacrylate and silver lacquer - and they borked more than one CPU in the process. But all they did then was take an XP 1900+ to the "2000+" 1666MHz speed mark. Which is a big fat 5% faster than the 1900+'s stock speed, and a total waste of time. OK, that's as far as the multipliers go - but if you're starting with a 1900+ and thus know that fiddly multiplier unlocking modification can only possibly give you 5% more than you can otherwise get, nobody who's not just doing it for demonstration purposes, as the Tom's Hardware fellow is, should bother. Getting back to the question of whether unlocking actually gives you a good chance of running the CPU significantly faster than you can with simple FSB overclocking - well, the answer seems to be "maybe", if your RAM and motherboard and other components aren't that hot, but "no" if they're all good. 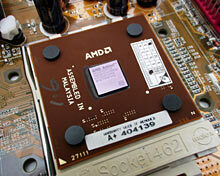 Generally, with previous AMD processors, unlocking has been worthwhile. But the Athlon XPs don't seem to have a ton of speed headroom unless you use heroic active cooling, whether they're unlocked or not. And if you've got a hot buttered KT266A or other current Socket A tweaker's motherboard, then 150MHz FSB seems very likely to be within your grasp with any quality RAM. On the last page of the Tom's piece, they did try FSB overclocking by itself on their unlocked chip. Screaming-agony-redline speed with water cooling turned out to be a rather unstable 1836MHz. That was from only 153MHz FSB on a KT266A board, which isn't a big ask; it was just using the native 12X multiplier of the 1900+ CPU. So it very probably represents a real CPU core speed limit, not something else. Wind back from this can't-boot-Windows speed, wind back a bit more to allow for less outrageous cooling, and chop off a bit more again for a safety margin, and one may charitably say that about 1750MHz should be attainable. It might not be, but let's assume that it is. Well, if that's the case, then that's a 1900+ running less than 10% faster than the 1600MHz that my cheap FSB-overclocked 1600+ managed. Just using the computer, you wouldn't notice the difference. Even if you actually did propitiate the right deities, spend more time and money on a hyper-mondo cooling system, and as a result got a rock solid 1836MHz computer, you'd still be less than 15% faster than the no-fuss FSB-overclocked 1600+. Lest you think this is all just sour grapes from someone who got sick of peering through a magnifying glass at a greasy pin, do feel free to e-mail me if you manage to find some harder data on the unlock-versus-FSB issue. I'm not holding my breath, though. What operating system am I running on my new PC, I hear my imaginary friends asking? With a disk footprint of more than a gigabyte, you'd bleeding well want it to be good. I was running Windows 2000 on my previous workaday machine. Win2000 is good, too. If you've got Win2000, I am quite unconvinced that the extra bits in WinXP are worth WinXP's substantial price. You're talking more than $AU400 retail for even the Upgrade edition of WinXP Pro, or a bit less for the OEM full version, for sale with a new PC; Aus PC Market have that for $AU341 delivered. That's a big chunk of change for what amounts, from my point of view at least, to a big fat service pack for Windows 2000, not a whole new OS. If you're running a Win95-series OS, though (95, 98, 98SE, ME...), switching to an NT-series OS like 2000 or XP is a much smarter idea. Never mind all of the fancy fruit that Microsoft have tacked onto XP; I just found myself turning most of those features off, one after the other, as I gave them their chance to impress me and they failed so to do. No, what you're paying for is what Microsoft should have given you in the first place - a computer that doesn't bloody crash all the bloody time. Win2000 needs quite a lot of CPU power and a frankly silly amount of disk space and RAM in order to run smoothly; WinXP is even worse. But preposterously powerful PCs are cheap these days. WinXP is happy as a clam on a 1GHz Duron box with 512Mb of RAM and a 40Gb hard drive. Those numbers sounded like total Buck Rogers material back in the Windows 3.1 days, but these days such a machine is pretty much an entry-level clone, and a computer with that configuration will have near-zero resale value in another three years. Anybody who reads Microsoft's puff pieces will be pretty sure that Windows XP (or, as its friends call it, Windows Take Me, Take Me, You Naughty Hackers, I'm Yours) is the plug-and-go perfect computing experience that everybody who's never used a Mac has been waiting for. It's not, of course. You have to install drivers and patches and configure stuff and work around things, as usual. WinXP has drivers for lots of things, but I had to download a driver for the Abit AU10, and there were updated motherboard drivers in the latest Via 4in1s, and the standard WinXP graphics card drivers don't do OpenGL so you still need other drivers to suit your 3D card, like the Nvidia reference drivers, for instance. And you'd better believe you need to hit Microsoft's Let's Just Pretend It Was OK In The First Place Site to remove the "Welcome H4XX0RZ" mat from in front of your PC. I was in no great hurry to do this, since my LAN hides behind a small plastic box full of Linux, but if you've got a direct Internet connection, WinXP's much-vaunted built-in firewall will, I think you'll find, not actually wall very much fire at all, if you don't patch the OS. I dare say there are some people who totally adore the round-cornered pseudo-3D Windows-crossed-with-Aqua interface look that WinXP defaults to, but I'm not one of those people. The new-style taskbar takes up too much space and clashes with any window with which it shares the screen, the new-style window gadgets are unnecessarily chunky for persons with sufficient manual dexterity to click on the old ones, the animated-everything is just distracting (even more so than Win2000's default animations...), but what the hey. You can turn it all off. There are some little cosmetic corners where Microsoft just didn't seem to remember to do anything at all. There are, for instance, still no fab groovy screen savers. You can have a slide show of your pictures as a screen saver, but apart from that it's still the old Pipes and Flower Box and Mystify and so on. I just use power-save screen blanking instead of a flashy saver anyway, but lots of people adore silly screen savers. I suppose they can just spend their time watching a Windows Media Player Yule log, or something. On the subject of which, the more I used Windows Media Player, for music at least, the more I wanted to go back to Winamp and Musicmatch Jukebox. It's not too hard to defeat Microsoft's decision not to allow MP3 ripping with WMP, but its interface is still clunky and awkward, and for CD ripping, Microsoft's album database still leaves something to be desired. I fed the PC a compilation CD that I got for Christmas - a two-in-one "Soul Connection Volume 1 and 2" disc from a local Australian bargain bin outfit which is nonetheless, as far as I know, a perfectly legal non-bootleg disc. The CD was identified as some other "Soul Connection" CD by Media Player, despite there obviously being far too many tracks in a quite different order. All tracks mis-identified, half of the tracks not identified at all. The track listing on the back of the CD isn't correct either, mind you, so this disc is clearly a worst case scenario. But really, guys; if you've just confidently identified a 19 track CD as being a 10 track one, you need to have a bit of a think about what you're doing. I fed Windows Media Player a few more discs to see what it made of them, and was unimpressed when the first one I tried, Jethro Tull's Thick As A Brick (1972), was identified as Daft Punk's Alive (1997). Hey, I can see that. They sound exactly the same to me. This was just bad luck, though. A handful of other CDs, both well-known and somewhat obscure, were then correctly identified. Which was nice. But when WMP reached the 7 minute 45 second mark in an allegedly 6 minute 23 second MP3 track because it didn't realise the file was using variable bit rate encoding (the song was actually more than 13 minutes long), I drew the line. Winamp was reinstalled. There are compensations for the WinXP... quirks. Windows now seems to finally be capable of not polluting every window in sight with the display settings of the one you just closed, for instance. I wouldn't swear to it, but it's working so far. And it starts up faster, not that that matters much once you've finished setting stuff up. And system sounds no longer seem to be set to K-Mart Advertisement Volume, so they don't punch through your MP3 playback like machine gun fire any more. ...which is as good as I got text to look using Microsoft's online ClearType tweaker. Odd uneven-looking text vaguely suggestive of the output from an elderly typewriter does not turn my crank. Oh, yes; Microsoft (or Nvidia, or both) totally haven't fixed Win2000's dumb Nvidia-chipset OpenGL refresh rate problem, in which OpenGL games on Nvidia-chipset cards do not inherit the desktop refresh rate when you use the desktop resolution, or indeed any other resolution. They default to 60Hz, which is nasty. A decent number of games have in-game refresh rate setting, but many don't, and get away with it because in the Win95-series OSes, everything just inherits whatever you've set up for a given resolution in the normal desktop resolution configuration. If you've never set your desktop resolution to the resolution you're using in a game then you'll get the default refresh rate, but if you have, you'll get whatever you set when you did. Win2000 and WinXP don't work that way with Nvidia cards, for obscure reasons. Fortunately, the highly useful NVidia Refresh Rate Fix utility has been updated to work with XP, and works every bit as well as it ever did. Which is to say that it probably disables your TV output (apparently because there needs to be a 50/60Hz bottom refresh rate option for TV output to work, and the fix utility gets rid of all of the lower refresh rate options to force the system to use the higher ones), but is otherwise flawless. WinXP doesn't seem, based on my experience so far, to be any more stable than Win2000 was. The same crummy applications still seem to be able, against all reason, to smash the system flat. For instance, if you're loading an Acrobat file in IE6 (using Adobe's plug-in viewer), do not try to go Back before the file's loaded, or your IE window will probably hang. And then there's a significant probability that, a minute or so later, the whole of WinXP will collapse in a screaming heap in sympathy. WinXP has the decency to auto-reboot, by default, when something eats its brain. On the down side, it also defaults to wanting to send a report to Microsoft every time something crashes, and to attach files of yours to the report which you may or may not want to send to Seattle. Behold: One glowing cable jungle. I'll swap some nifty-looking rounded cables in shortly to make it a bit more manageable. All those fans keep the air moving through it passably well at the moment, though. Lian Li put high intensity power and drive LEDs in the PC-65; the power light's blue, the drive light's red-shading-to-pink. They are really bright. Even through the oval diffusers built into the front panel, both lights cast a noticeable penlight beam across the room in the dark. Without the front panel, you can read by them. They're a good match for an internally illuminated PC. And so, the march of technology continues. This box ought to do for, oh, at least a fortnight. 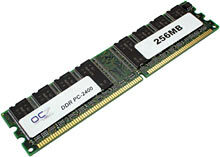 OCZ memory module kindly provided by OCZ Technology. Athlon XP unlocking kit kindly provided by HighSpeed PC. Pixelview GeForce2 Ti video card kindly provided by Prolink. Readers from Australia or New Zealand can purchase pretty much every other bit of this PC from Aus PC Market.